The Moroccan Center for Arabic Studies engages in education year round. MCAS has a very flexible timetable; each student may choose to study for as little as one week and as long as many months. Our curriculum includes Modern Standard Arabic, Colloquial Moroccan Arabic, Media Arabic, as well as calligraphy. We cater to students with many different levels of experience with the language from beginner to advanced. Our beginning levels follow the curriculum of Alif Ba (Georgetown Press), while the intermediate level courses follow the Al Kitab I & II (Georgetown) curriculum as a basis for the study of Modern Standard Arabic, while utilizing reliable and innovative local sources as a supplement. Advanced courses cover Al Kitab III and beyond. We also offer Moroccan Colloquial Arabic courses that immerse our students in Morocco’s dynamic every-day language. The classes stress the use of language in everyday situations. While we offer flexibility regarding the intensiveness of study, our average course lasts 4 hours a day. In 2 lessons each day, students work on grammar, pronunciation and vocabulary, while in the other 2 lessons, they focus on reading, writing, speaking and listening. Textbooks and a variety of other materials are used in instruction, including role-playing, newspapers, magazines and other materials. We offer lessons in special topics as well: media studies, film and theater, local culture, current events, politics, and research using the internet. Intermediate and advanced students also have the option of studying in the test-preparation and business classes. 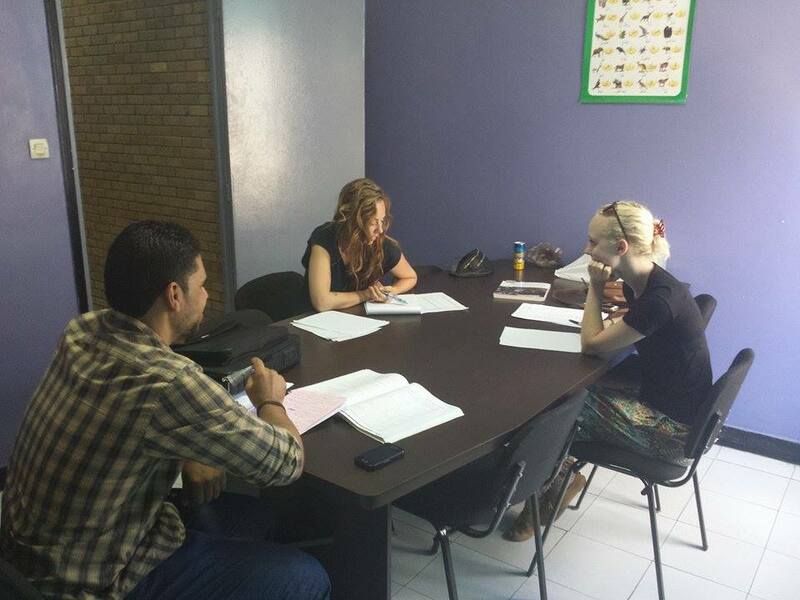 Our intensive courses are for students who want to maximize their language practice during their stay. These courses focus heavily on speaking and communication skills: the morning consists of 4 lessons in communication skills, while the afternoon consists of 2 lessons in special topics, providing the opportunity to learn the local culture and customs. All languages course at MCAS are compatible with with the National Standards set forth by the ACTFL (American Council on the Teaching of Foreign Languages). In addition to classroom studies, MCAS also offers affordable one-on-one lessons with our qualified staff. These classes are for students interested in a specific field of instruction or in need of a flexible schedule. The Intensive Course Study at MCAS is a week or more long enrollment in which the student will essentially receive a personal Arabic tutor in order to focus on a certain element of Modern Standard Arabic or Darija, perhaps both. Calligraphy, speaking, writing, literature, business, satellite or local media are just some of the possibilities under the Intensive Course Study program. The hours for intensive study are generally up to the student and can range from 2 to 6 hours a day of instruction, and up to 5 days a week.Tuition and rates are dependent upon the schedule as chosen by the student the standard rate is MAD 200 ($23; €20) per hour.